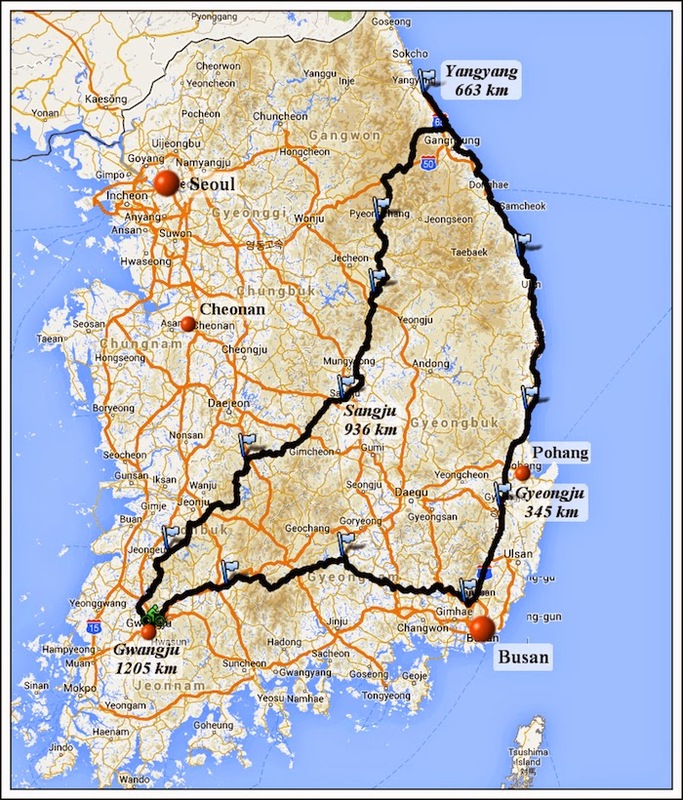 On June 5th 2014 at 4 a.m., riders will mount their bikes in Gwangju to tackle the third edition of “The great Korea 1200”. This will be an epic journey of 1200 km in 90 hours (four days and 3 nights), a true endurance test for “legs and mind” in the "land of the morning calm". 궁극의 지리산 도전이라 할 광주 200K는 올해 한국 란도너스에서 선보이는 브레베 중에서도 가장 어려우면서도 설레는 대회라 하겠습니다. 광주에서 출발한 참가자들은 동쪽의 남원으로 향하는데, 여기까지는 아주 쉬운 단계입니다. 거기서 란도너들은 20km 넘는 거리에 걸쳐 1000미터 이상을 올라서 지리산의 가장 높은 고개인 정령치에 오르게 됩니다. 달궁계곡으로 잠깐 내려간 다음에 두 번째 오르막을 오르면 성삼재가 나옵니다. 거기서 파전과 시원한 마실거리를 즐겨보세요. 언제나 금방 끝나버리긴 하지만 기분을 상쾌하게 해주는 10km 길이의 1100미터 내리막 다음에는 구례가 나오고, 다시 광주로 돌아와서 한순권님의 샵에서 완주를 축하하게 됩니다. 브레이킹 열 때문에 무리가 갈 수도 있으니 카본 휠은 집에 두고 오세요. By all measures the Gwangju 200K, the ultimate Jiri-san challenge, is the hardest and most exciting 200K Korea Randonneurs offer this year. 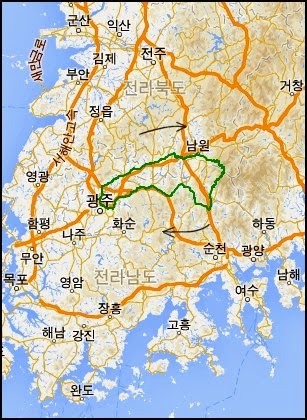 From Gwangju, riders will head east to Namwon, an easy task. From there Randonneurs will climb more than 1000 meters over a stretch of 20km to reach Jeongryeongchi, the highest pass in the Jiri-san. 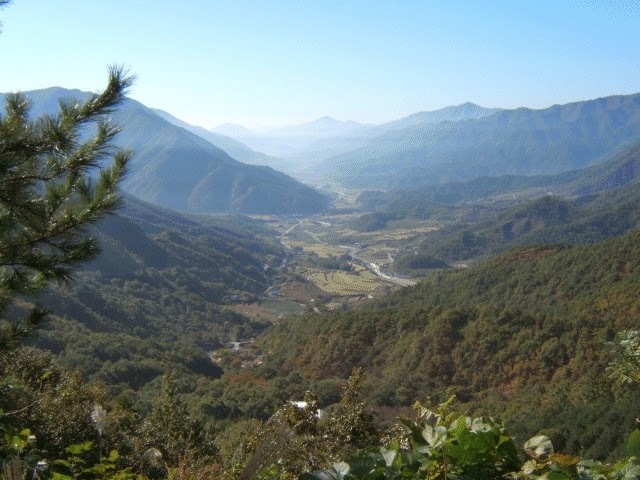 After a quick descend to Dalgung valley, the second climb will take us to Seongsamjae. Try the Pajeon at the restaurant at the pass - it is the best in the Jiri-san. A fast and exhilarating 1,100 meter descend over the next 10km takes us to Gurye and then back home to Gwangju where we will celebrate in Han’s bike shop. Leave your carbon wheels at home as the heat from the breaking might be too much for them. 한국란도너스는 모든 2014년 열릴 브레베들을 위한 새로운 등록 시스템을 구축하였습니다. (http://www.korea-randonneurs.org/reg/register.php) . 새로운 온라인 등록 시스템 구축은 한국란도너스의 최고의 IT부서 (임 성훈) 에서 맡아 해 주셨습니다. 저희는 부산, 천안, 광주 그리고 서울의 모든 거리의 (200k, 300k, 400k, 600k) 브레베들을 개최하고 있으며, 내년에는 최초로 포항과 상주에서 시작하는 200K 브레베들을 선보일 예정입니다. 또한 내년에도 서울과 부산에서 시작되는 1000K 브레베들과 한국란도너스의 주요 브레베인 광주에서 시작되는 1200K 그랜드 란도니 또한 열리게 될 것입니다. Korea Randonneurs has implemented a new registration site for all 2014 Brevets (http://www.korea-randonneurs.org/reg/register.php). This was made possible through our world class IT department (Lim Seonghun). 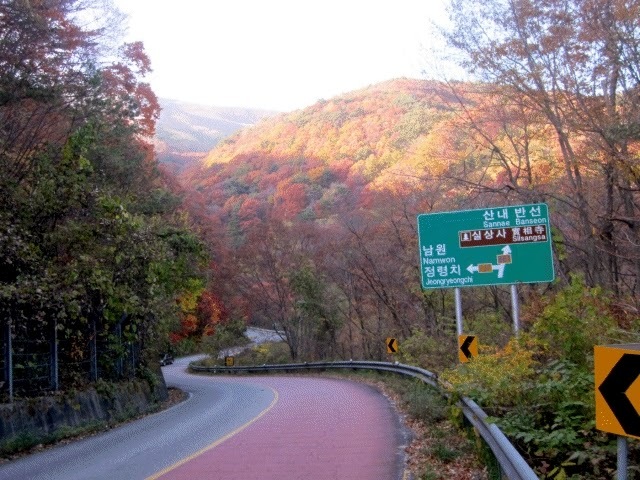 We offer Brevets covering all distances (200k, 300k, 400k, 600k) in Busan, Cheonan, Gwangju and Seoul. For the first time we also offer 200K Brevets starting in Pohang and Sangju. We again offer the 1000k SBS out of Seoul and Busan and our flagship 1200k Grand Randonnee out of Gwangju. The Korean Fleche is a team event, with each team covering at least 360km over a 24-hour period. On April 19, teams will start from different cities at 9 a.m. and after 24h / 360 km in the saddle riders will descend onto Gwangju with the finish at Han’s bike shop followed by a celebration meal. In 2013 nine teams finished (video by GomGom) and an even bigger number is expected in 2014 (information on the 2014 Fleche). Korea Randonneurs has three award categories, KR5000, KR10,000 and the new and ultimate KR20,000 (award info). In order to qualify for these awards riders need to also accomplish one or more Fleche and 1200k events. If you plan to qualify for these awards check the 2014 calendar for information on the Fleche and the 1200K. The award ceremony will be held during lunch at the finish of the Fleche on April 20, 2014 in Gwangju. 최고 수준의 성취를 이뤄낸 회원들을 공인하고 축하할 수 있는 새로운 타이틀을 한국 란도너스에서 준비했습니다. 이는 국제 장거리 사이클링계에서도 독보적인 영예입니다. 이 타이틀을 획득하기 위해 란도너들은 연속 다섯 연도 동안 총 20,000킬로미터의 브레베를 달려야 합니다. 다른 나라에서의 브레베 역시 계산에 포함시킬 수 있습니다. (외국 브레베의 적격 여부는 운영회의에서 결정하게 됩니다.) 5년 동안 라이더들은 다섯 번의 SR 시리즈와 세 번의 플레쉬, 세 번의 1000k, 세 번의 1200k를 완주해야 합니다. 나머지 거리는 어떤 브레베도로 채울 수 있습니다. 이 조건을 채운 라이더들은 그 빛나는 성취를 보여줄 수 있는 기념 저지를 받게 됩니다. Korea Randonneurs has established a new award to recognize and celebrate its most accomplished members. This is the most-distinguished award in International long-distance cycling. In order to qualify for this award, Randonneurs have to cover a total of 20,000 Brevet km in five consecutive calendar years. Brevets from other countries can count towards this award (the board of directors will determine the eligibility of foreign Brevets). During the five years, riders have to complete five SR series, three Fleche events, three 1000k and three 1200K Brevets. The remaining distance can be filled with any Brevet. Riders, who have fulfilled the requirements will receive a commemorative jersey to demonstrate their accomplishment. 올해의 하이라이트는 역시 광주에서 출발했던 1200k와 1000kSBS였습니다. 긴 시간 동안 빗속을 달려야 했던 올해의 SBS는 특히 난이도가 높았는데, 17명의 참가자가 끝까지 살아남았고, 그 중에는 일본에서 온 여성 라이더 마키요 고토 님도 있습니다. 김영민 님은 코스 기록을 60시간 이하로 만들었습니다. 올해의 최고 라이더는 6860km를 달린 Jason Ham 님입니다. 문형기 님과 강대호 님(각각 5,060km)이 뒤따르고 있습니다. 전체 누적(2010년부터 누적 거리)에서는 Jason Ham 님이 11,720km로 팩을 이끌고 있고, Lothar Hennighausen 님(11,120km)과 Russel Morris 님(10,320km), 곽동호 님(8,460km)이 그 뒤를 따르고 있습니다. 2013년의 223,000km를 통해 한국의 란도너들은 이제 세계 15위권에 들게 되었습니다. 내년에는 10위권으로 올라가봅시다! What a great year! Korea Randonneurs in Busan, Cheonan, Gwangju and Seoul clocked a total of more than 223,000 km – the equivalent of 6 times around the equator. For the first time we ran Brevets in Seoul and the response was overwhelming. Thus more events will be added in 2014 (calendar). 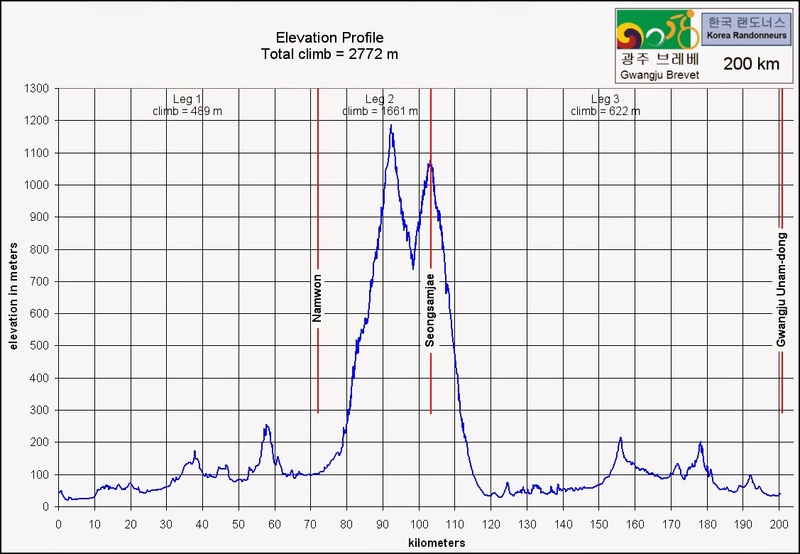 Our highlights were again the 1200k out of Gwangju and our 1000k SBS (2013 results). With driving rain for most of the ride, SBS was especially hard this year and 17 riders survived, including our female rider Makiyo Goto from Japan. The course record (57:21) is now held by Kim Young Min. The top rider this year was Jason Ham with 6,860 km followed by Moon Hyung Ki and Kang Dae Ho 5,060 km each). In the overall standing (distance since 2010), Jason Ham leads the pack with 11,720 km followed by Lothar Hennighausen (11,120), Russel Morris (10,320) and Gwak Dong Ho (8,460). For 2014 we plan additional Brevets in Seoul, Sangju and Pohang. We will also offer the ultimate 200K Brevet with 5,000m of climbing and the 1200K out of Gwangju has been completely redesigned. The annual Fleche will be held on April 18/19 with the target Gwangju. With 223,000 km in 2013, Korea Randonneurs are now in the top 15 of the world. Lets move up into the Top 10 next year!